Sony has revealed its latest Android tablet at IFA 2012: the Sony Xperia Tablet S.
The new tablet comes with a slim aluminium body, a 'splash-proof design' (for the kitchen, see?) and the option of some specially-made docks and other accessories which you can buy separately. It may look a little familiar, given that we've a) seen it in leaks galore over the past few weeks and b) seen it in chunkier form as its predecessor, the Sony Tablet S.
Running this puppy are the quad-core Nvidia Tegra 3 processor and Android 4.0.3 (Ice Cream Sandwich) rather than the more up-to-date Jelly Bean. The chillier snack-set was rumoured in the latest Xperia Tablet leak; Sony hasn't said whether the device will get the Jelly Bean upgrade or not. Available in three storage options (16GB, 32GB and 64GB), the tablet comes with Bluetooth 3.0 and Wi-Fi connectivity, and there's an 8MP camera on the back with a 1MP HD web snapper on the front too. 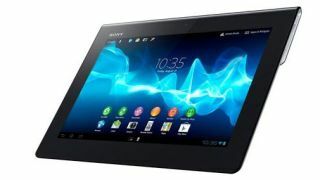 Like its similarly-monickered predecessor, the Sony Tablet S, the Xperia Tablet S has a laser-like focus on media apps which should all be in line with the Xperia smartphones now too. This means that the likes of Walkman, Music Unlimited and Sony's movies app will now work the same across all its smartphones and tablets. Keeping all that media action going is a 6000mAh battery which Sony reckons will give you 10 hours of web browsing or 12 hours of video playback from a full charge. As for an official release date or price for the Xperia Tablet S, we're still in the dark – we've had our sleuthing hat on and managed to hunt the slate down at IFA 2012 so check out our many and varied thoughts on the new slate in our hands on Sony Xperia Tablet S review.